This sub-category is for information pertaining to the women’s team. Following the ladies success in round 1 of the SM 2016 qualifier, round 2 came around with the team carrying the belief from their previous performances but also knowing that they were no longer going to take the other teams by surprise. With the weather threatening rain, but eventually holding throughout the day, conditions were perfect for rugby as the ladies prepared for their first match against Pingvin, the team they had beaten in the final during the previous round. Overall, the game was a very scrappy affair, with neither team really being able to play good attacking 7s due to a combination of mistakes as well as perhaps a lack of clear thinking. The games first try eventually came off of a Lugi scrum set around the halfway line and was taken by Martina following simple use of hands and footwork to beat the Pingvin backline. Pingvin eventually returned the favour later on in the first half when the Pingvin 9 found a midfield mismatch and skipped through the line to dot down near the posts to leave the half time score at 5-5. The half time message to the girls was for the team to calm down, collect itself and get back to basics, which the team took on board to take a lot more control in the second half through more defensive pressure. Second half trys came once again from Vivlund off a scrum place close to Pingvin’s line as well as Sandra Olofsson scoring perhaps the to finish the game following the ball being moved to the wing off a turnover as a good step to the outside to see her in at the corner. Final Score: Lugi 15 – 5 Pingvin. The day’s second game saw us take on the hosts and once again saw the ladies contest a tight game with neither team really attaining dominant phases of possession. Lugi always looked the most likely to take the spoils, but will be a little disappointed that the scoreboard didn’t reflect the dominance they should have achieved following the standard set in the previous round. The first impact on the scoreboard was made by the impactful run of Norén off of a Lugi penalty on their own 22, simple hands pushing the ball to one of our big runners and simple footwork seeing her go through a gap and run in from 80 meters out in her home town. Martina added the second Lugi score of the game following some of her own good work at the breakdown before rounding the Ronneby defence and taking us into a 10-0 half time lead. Ronneby had their chances in the game and on a better day would have won the match if they’d have been more precise in their execution, but in the second half it was Lugi once again who got onto the scoreboard first and once again it came from a simple penalty move and footwork, this time by Agnes Lindgren who gratefully stepped around a girl who was seemingly unwilling to challenge her rampaging run and dancing feet. However, it was Ronneby who would have the last say in the game following an arcing run by their winger to get on the outside of the Lugi defence before running down the line and scoring under the posts. Final Score: Lugi 17 – 7 Ronneby. Following wins in the opening games, the ladies were guaranteed a spot in the day’s final no matter the result against Malmö. 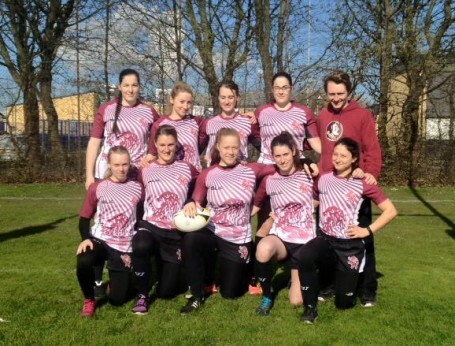 Following two sub-par performances in the other games, the ladies really started to perform and play to the standard they had produced in the previous round, and with Malmö also playing to a high standard, what followed was a very good game of rugby 7s. Following a even couple of minutes, Lugi eventually broke down Malmö’s left flank through a series of good offloads and solid support play. Once Lugi got near to the opposition’s line, it was another offload that finally unlocked the Malmö defence with Malin scooting over the line following Sara Kaminsky’s work in the tackle. Following the kick-off, Malmö maintained a good spell of possession, and with Lugi unable too force a turnover we eventually became stretched in defence, leading to a couple of good offloads allowing Malmö to break through the middle and score. With time running on in the half, the ladies did well to keep the ball away from the opposition, but soon came a cropper as indecision with the ball in midfield led to a turnover and Malmö getting on the edge of our defence to score once again. The half time score would see Malmö with a slim 12-5 lead. Shortly after the second half began, the ladies were gifted possession on a penalty after the kick off but quickly gave the ball back to Malmö who once again took good care of the ball, eventually getting the ball to their speedster from 20 meters out and the scoreboard ticked over to 17-5. In the past, Lugi heads would have dropped at this point, but the girls showed their mettle with a quick reply after a midfield break by Martina eventually forced Malmö into a penalty. From there the ladies showed their abrasive side with some powerful running and Sara Kaminski ending the sequence by carrying three Malmö players over the line from a few meters out to bring the score back to 17-10. One thing the team must improve on is their ability to refocus and regroup following their own scores, something that affected us in the previous round and once again reared its head in this match. 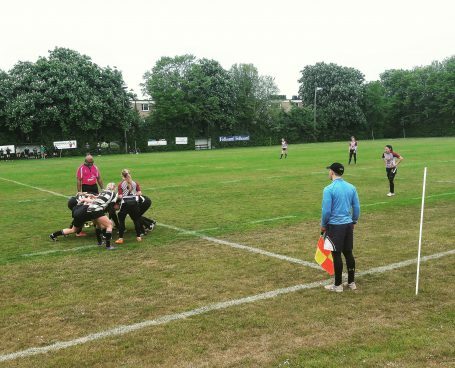 With only seconds on the clock from the ladies pulling to within one score, they found themselves two scores down as Malmö glided around the outside of our defence straight from the kick off in order to score their fourth try of the game. Even with the outright win looking a little off the cards the ladies still stuck to task, producing a fantastic defensive sequence to keep Malmö at bay and eventually forcing the turnover which Sonnenholzner pounced on with some footballing skills, only being denied a certain try by being tugged back by the last Malmö defender. The referee made the correct decision in awarding the penalty try, bringing an end to a well fought match even if it wasn’t in Lugi’s favour. Final Score: Lugi 17 – 22 Malmö. Off the back of a fairly solid day’s rugby, Lugi once again found themselves in the qualifier final with Malmö meeting us there for one more tussle. Our ladies took the initiative following a lineout near halfway, as Martina took a good short line to break through the Malmö defence and put us 5-0 up in a flash. Once again however, our opposition were afforded the opportunity to strike back after a short kick off lead to a penalty and a well executed set piece saw Malmö get around our defence for their first try and a 5-5 scoreline. What followed from the Lugi girls was possibly the best passage of play in the entire day, resulting in three phases of possession (with a penalty thrown in) taking the team from their own 10 meter line to over the whitewash. Cornelia Norén once again dotting the ball down as just rewards for her two impactful carries in the sequence. From there however, there would be no more Lugi scores with Malmö dominating in both possession as well as on the scoreboard. The game would turn on two Malmö kick offs, both being muffed by Lugi and both leading to trys, with our girls being afforded only once chance and being unable to capitalise. As it often is, it was these small margins that make the difference and whilst the girls were rightfully happy to come second, missing out on winning a second qualifier has provided lessons for them to take further in this year’s SM. Final Score: Lugi 10 – 22 Malmö. Next week our ladies will be back in action again in the third round of the qualifier in Trelleborg. This entry was posted in Match Report, News, Women's Team on May 17, 2016 by Ross. The ladies putting in some fitness work at a sunny Centrala IP. This entry was posted in Women's Team on May 8, 2016 by Ross. As has become customary, the Swedish rugby year got kicked off with Håckes Cup in Tipshallen, Växjö. 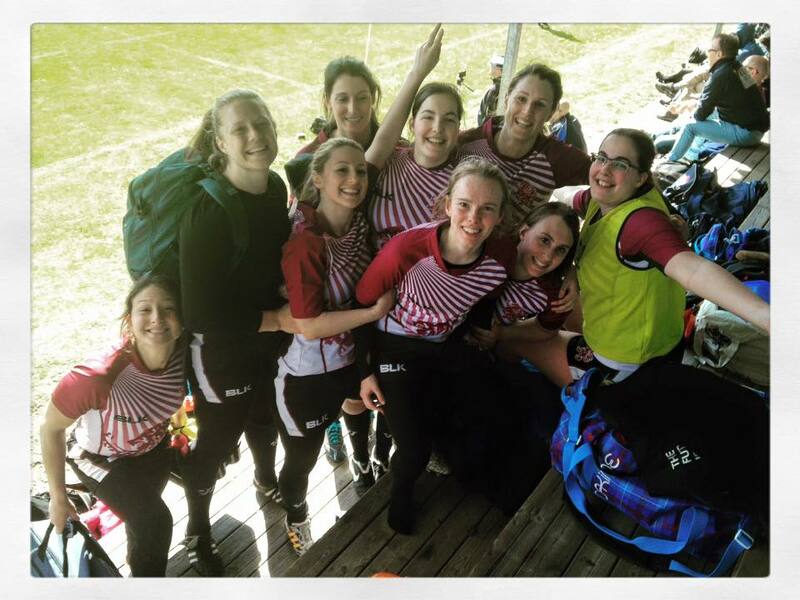 With the ladies section expanding to twelve teams this year, seeding had taken place for the drawing of groups and the ladies found themselves in what many would consider the toughest group, facing last year’s champions Gothenburg, perennial contenders Tabusoro Angels, and a always physical Vänersborg team. 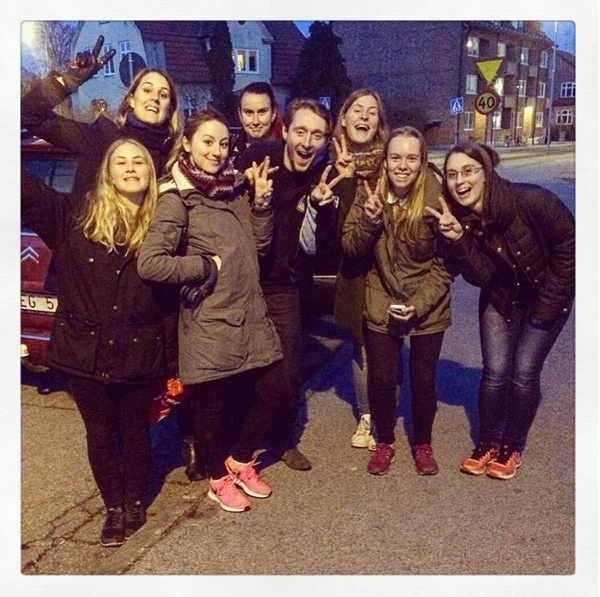 With the original idea of going as North 2 South, the team had been open to players from across Sweden as a form of invitational team to start with, but with a strong turnout from our own players (unusual, we know), we decided for the team to go as Lugi and add in a couple of extra girls. In the end the team sheet read: Malin Andersson, Tyra Bremborg, Cecile Kaminski, Sara Kaminski, Agnes Lindgren, Meliha Mehmeti, Sandra Olofsson, Elizabeth Sonnenholzner, Ida Tadic, Martina Vivlund with Josefine Devine (Uppsala), Sara Sundler (Uppsala) and Maddy Sala (Wexiö). 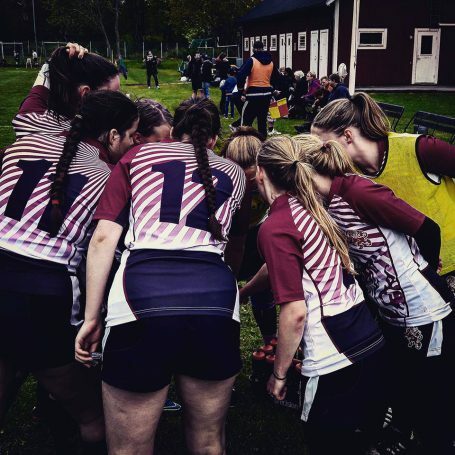 The focus for the tournament, as with previous Håckes Cups, was put on working on the basics of 7s play, learning to play with our newer players, and getting our rugby legs back under us before the upcoming season of SM 7s. With the first game against Vänersborg, the team set its sights on what was realistically their most winnable game going on Gothenburg and Tabusoro’s recent history. One thing the team has always seemed to lack in the past was the ability to start fast, but this year the team turned things on their head and were clearly the side that were ready to play from the off. Lots of early defensive pressure and some lovely attacking play allowed Agnes Lindgren in for the first score. Pressure from the following kick off and Vänersborg giving away a penalty close to their own line allowed Elizabeth Sonnenholzner to increase the lead with step inside that secured a quick brace and a 14-0 lead. In the second half, the game evened up considerably, with both teams committing errors to put themselves under unwanted pressure. However, it was Vänersborg’s who took advantage following a Lugi turnover in midfield, as their speedster was gifted an almost unchallenged run in for a try. 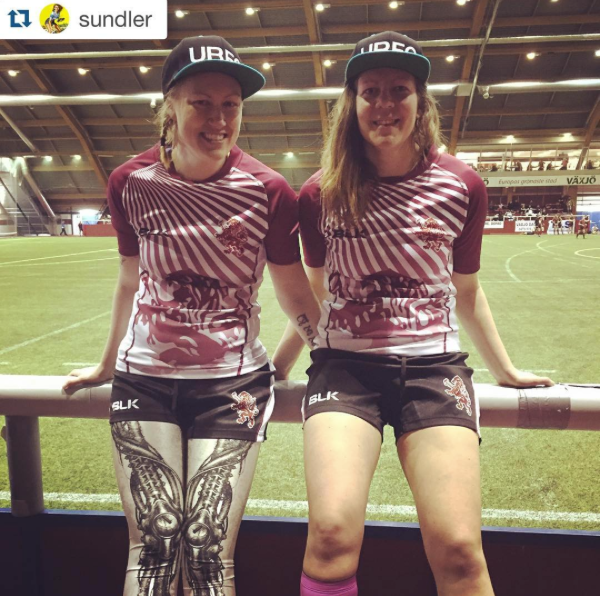 In previous seasons, this might have been a cause for heads to drop, but Lugi riposted immediately from the ensuing kick off with Sonnenholzner identifying the space and having beaten two defenders executed a textbook 2v1 to see Martina Vivlund rewarded for her close support with a run in try from half way. The remained of the game was played out in the opposition’s half, with the ladies being unable to take advantage of the added pressure they put on. Final score, Lugi 19 – Vänersborg 7. Following a very good start to the tournament, spirits were high, but with two of the tournaments best teams left to face, the players knew we were in for a fight in our last two games of day one. Unfortunately, neither game turned out to be much of a contest with Gothenburg and Tabusoro both running in 40 points on our girls. A combination of team rotation, inexperience and the higher class of opposition meant that our girls were ever really in the games, despite having very positive spells in both. Despite the scoreline, the team learnt some valuable lessons and felt more than prepared for day two in the bowl competition. 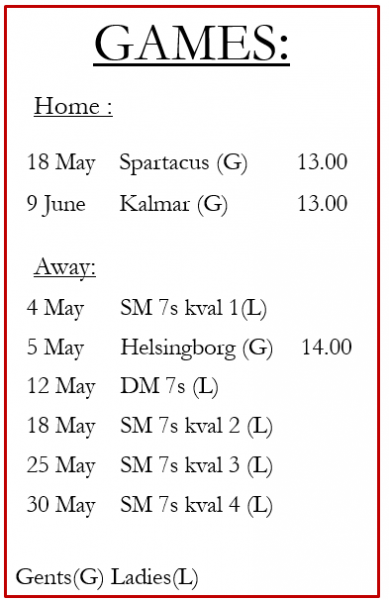 Due to the aforementioned seeding and perhaps a lack of competition foresight, the girls were drawn to face Vänersborg again to open up the second day. The opening to the game was a lot more even in comparison to the first contest, with both teams having good spells of possessions and scrambling well in defence following promising breaks. Once again, Lugi were the first to strike following a tap penalty near the oppositions line and some quick hands, Meliha Mehmeti crashed over in the corner after a quick step inside. The rest of the half played out in a similar fashion, with both teams creating good openings but ultimately failing to finish opportunities. The second half then became a tense affair, once again both teams matching each other evenly and absorbing periods of sustained pressure. However, it was Lugi that were the first to crack following some poor decision making in their own 22 and turning over possession to Vänersborg, with the team from the west quickly taking advantage and managing to get themselves over in the corner following some strong running. With the game on a knife edge and bodies and brains beginning to tire, it was Vänersborg that ultimately made the step up, scoring almost immediately from the following kick off after a Lugi mistake at the breakdown. With only a couple of minutes to go, and a score down, Lugi got a final chance after some quick thinking and a good break from Martina Vivlund got the team deep into the oppositions 22, ultimately however the attack fizzled out following a little poor handling and good defensive pressure. 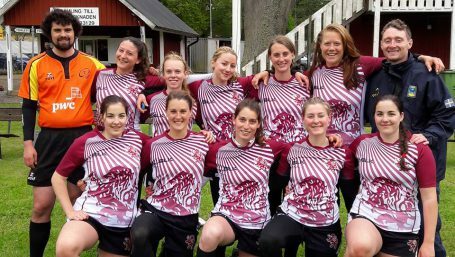 With desperation setting in, Vänersborg managed to run in the final score of a hotly contested game in the dying seconds and with that the Lugi Ladies were sent into the 11th-12th place playoff to face Sandviken Old Stars. Despite the disappointment of the mornings earlier loss, the team was resolute that they would finish the weekend with a win against the team that had been ranked fifth coming into the tournament, despite having failed to record a win in any of their games. The Old Stars were unfortunately low on numbers and morale and whilst you can only beat the team that’s in front of you, the game ended up being a one way affair as Lugi ran in 36 points to 0, even if they had had a penalty-ridden opening three minutes. A big positive from the game was the playing time given to some of our lesser experienced girls and the ability to try new combinations of players whilst still keeping our foot on the pedal. Whilst it may not have been the greatest game to finish on, it was still good to go home with another win. 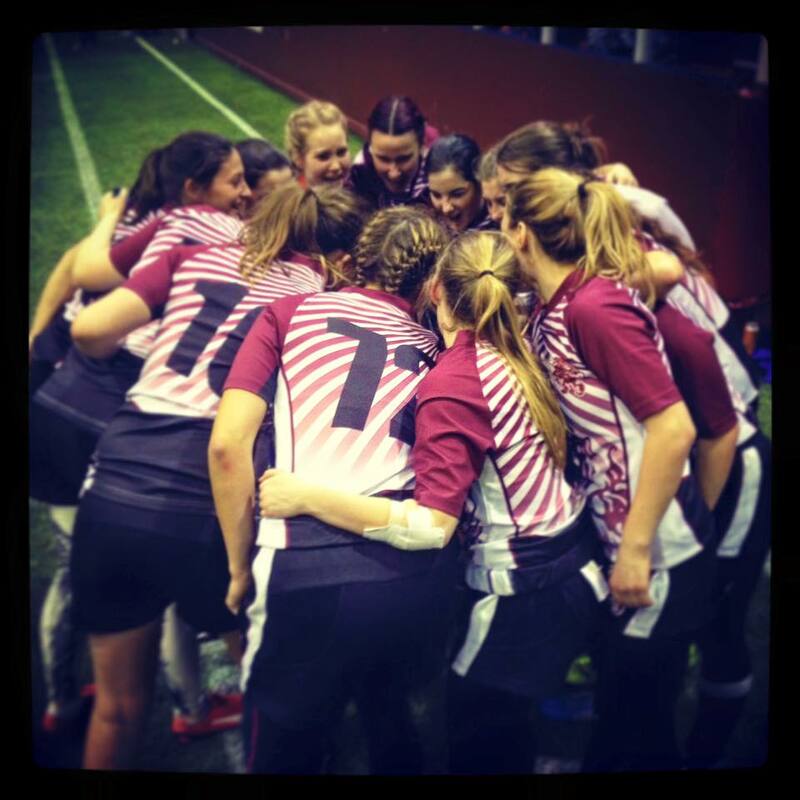 All in all, the team enjoyed their weekend, learning together and playing some good rugby. The lessons learned from our opening tournament will be invaluable as we move into the season and we will continue to build. 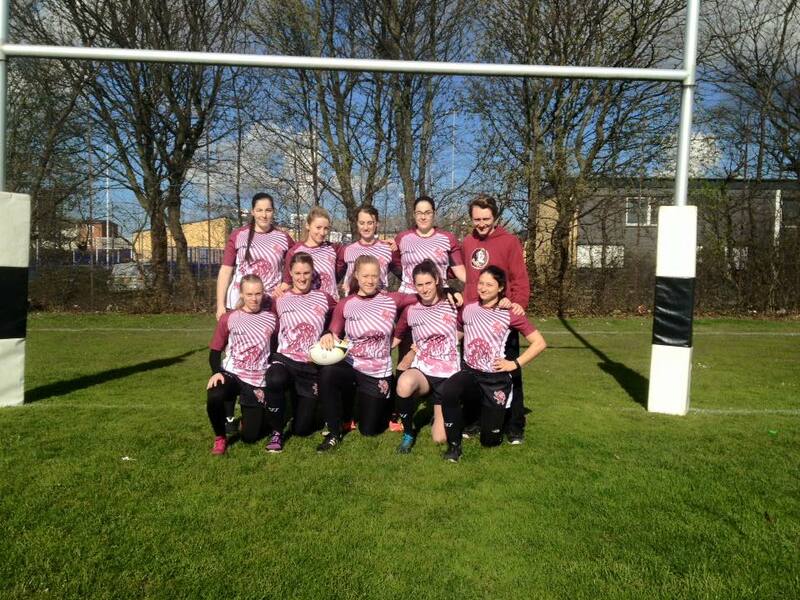 This entry was posted in Events, Match Report, News, Women's Team on March 15, 2016 by Ross.